Aguni Island is an environmentally rich island located 60km northwest of Naha City. The island is remote and hosts just one village. 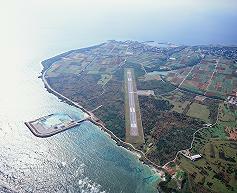 Aguni Airport is located on the northeastern part of the island. Construction of the airport began in December 1976 based on the third 5-year Airport Development Policy and the Okinawa Promotional Development Plan. It began operating in July 1978 with an 800m runway.